My bad on the blurry photo. This is maybe the second or third time I’ve ever asked a “stranger” if I could take their photo (my introverted self applauds my bravery and excuses my poor photography. Hope you will, too). 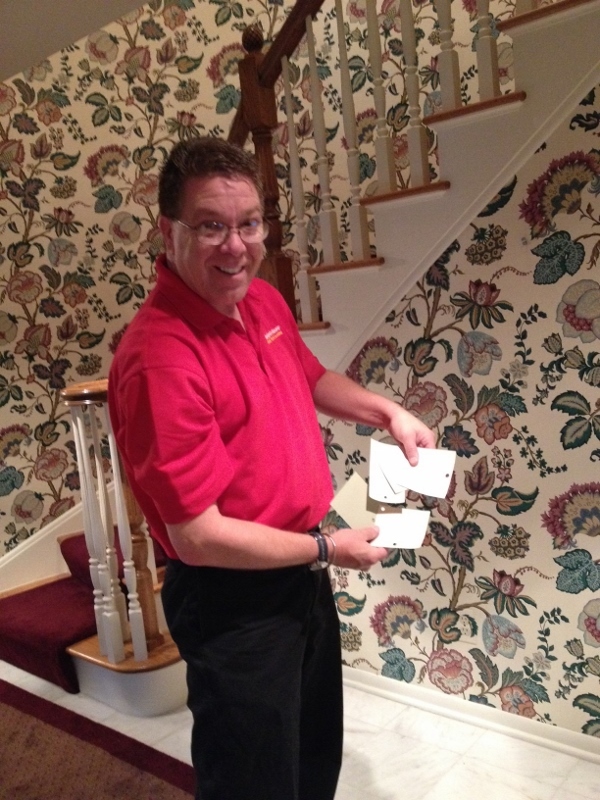 Meet Tim, the color expert at Shelby Paint (the local Benjamin Moore store). 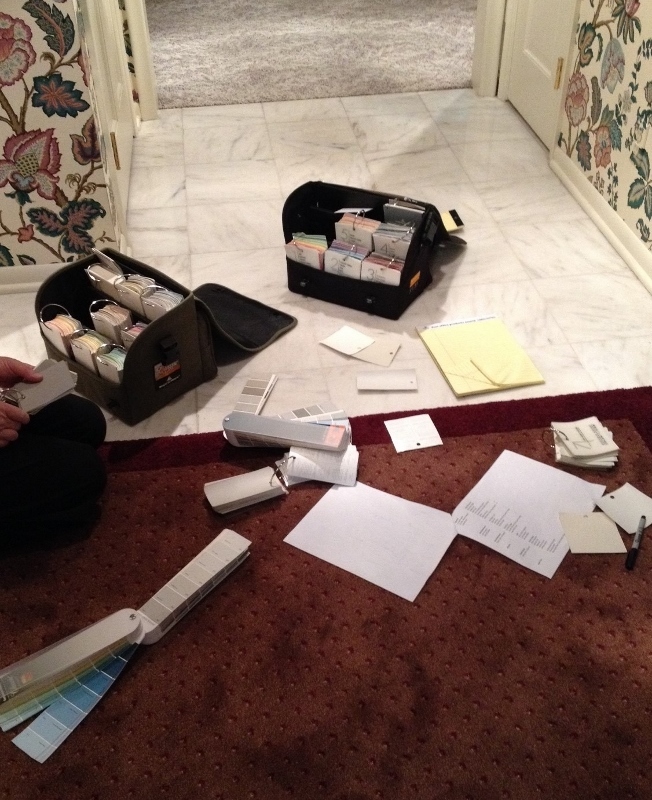 We met at the new house yesterday to finalize colors for the walls. But first, lets turn back time a couple weeks. I was in the thick of researching, reviewing and setting up appointments with various contractors and was starting to doubt my ability to make decisions (when you’re talking about spending large sums of money, you want to get things right. Or at least close). My (exasperated?) husband suggested hiring an interior designer, which pretty much everyone does here. And they are everywhere. Seriously, I have seen more interior decorator/design shops and businesses here per square mile than….well, at least than any other place I’ve lived. After giving it a lot of thought, I agreed we should go ahead and take money out of the home improvement budget and hire someone. However. My gut didn’t really want to go that route. So I called up my friend and former roommate Liz for her take on the matter. She completely changed my mind, arguing that so many places nowadays will provide design help for free or for a small fee that you can put towards goods or services (upholstery shops, furniture stores, paint stores, carpet places). And, she said, do you want to spend $150 an hour for someone to show you paint samples? No. You have a good aesthetic, she said. You can do this. Really what she did wasn’t change my mind. I already knew what I wanted to do (or not do, in this case). I just needed someone to believe in me. Before I spoke to her, I felt so overwhelmed and stressed by all of it – the scheduling, the interviewing, the decision-making. After I got it into my head that I could do it, I just got it done. Bing bang boom. Funny how that works. One of the calls I made was to Shelby Paint. For just $90 ($50 of which you get back in the form of a gift card), a “color expert” will meet with you and help you pick out a color (or in my case, colors) for your project. Bam. Flash forward to yesterday. How did you end up being a color expert?, I ask Tim. He tells me he started out in sales at another paint shop in town (which has since closed) in the early ’80s. One day his boss asked him if he’d be interested in helping a friend of his pick a color for his office (or house? Drat, I wasn’t taking good notes at this point). He goes over and helps the guy out. Then down the line, he helps another guy out and another, and pretty soon it becomes a regular thing. Galveston Gray, one of two possible grays for the master bedroom. Thankfully (and because I’m awesome), most of the colors I had on my shortlist worked well with each other, so we were able to take our time narrowing them down. 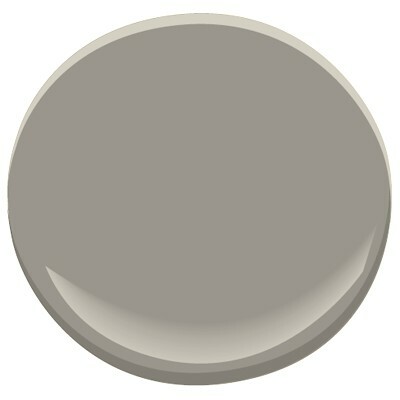 Tim made a couple suggestions and substitutions, for example, selecting a creamier white for trim and suggesting we paint the dining room ceiling the same color as the walls (Nantucket Gray, a very subdued gray-green that I had at the top of my list). That’s something I would never have thought of doing, but may actually consider (and if I like it, suggest to the husband over a glass of wine. Or four). To give me the full effect of how the dining room could make for a dramatic focal point, he closed the french doors, then walked to the front door, pretending to be a guest coming in for the first time. He walked past the dining room to the stairs…yes, he says, this could be a real “wow” moment. Especially after we replace the chandelier. Ahem. He was also interested in the other decor (paint, light fixtures, wallpaper, drapes) the previous owners had left behind. He would ask, “and are you getting rid of these drapes?” and when I affirmed, he would let out a small sigh of relief and say, “thank you” under his breath. Before he leaves, I asked him about trends. No one is using borders anymore (decorative borders that run underneath ceiling trim). People are going more neutral (Even here in Grosse Pointe? Yes, he says. People are using furniture more as accents or showpieces now). And he’s seeing lots of soft yellow. In kitchens, but also in other parts of the house. And one more thing… Wallpaper? It’s coming back. 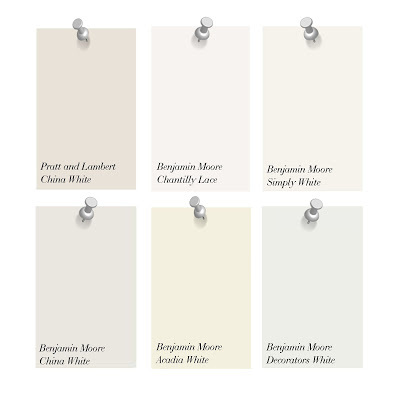 This entry was posted in Grosse Pointe, Small Town Living and tagged Benjamin Moore, Color, Home Decor, Home Improvement, Home Remodel, Interior Design, Paint, Small Town, Walls. Bookmark the permalink. I so enjoy this “trip” with you, as you move into your new home. To add my two cents to the discussion – I know what I like when I see it but have trouble getting there. A decorator (who helped Leslie) helped me – she did the “heavy lifting” for me at a very modest hourly fee. Worth every penny! Actually, I’m sure they would be SUPER helpful. Of course for purposes of the blog entry, I played it down a bit, but I know they can come up with things you hadn’t thought of, for example. But….I’d rather spend the money on my new kitchen! Drool Just don’t paint it deep purple. Saw that once shudder can you imagine? Your kitchen the color of dark blood. Wallpaper coming back! But never left GP. :) LOOOOOOVE this grey. I want to roll in it.